Similar to my post from last week, this is yet another iteration of my spring (and basically anytime) uniform. Button down shirt? Check. Skinny jeans? Check. Flats? Duh. This shirt was a great Zara score - I had to have it after seeing the lovely Meg Biram rocking it so well at IFBcon in February. Also, I can hardly ever resist a giant silky shirt for any reason, so here we are. Dressed down: If you're a longtime reader (Heyyyy! I love you!) you might remember these Treton kicks from a post years ago for the Nylite Project. I got a fresh pair for SS13 and have found myself wearing them to the office, out for drinks, running errands — just about everywhere. With light wash cuffed jeans and this shirt, I really do feel like I'm ready for any activity a spring day (into night) might bring. Dressed up: Are you ready for this? Ponytail and pumps. That's it. Throw the hair back and slip on my go-to sassy suede Aldo pumps (most similar to these) and I feel totally transformed. Let's be honest, a statement necklace from Lulu Frost definitely doesn't hurt, but either way you get a different effect with just two simple changes. I don't know why really, but there's something that feels very sophisticated when wearing you hair back with heels. It says I'm a no-nonsense fancy person who wants their hair out of the way when dancing and clinking champagne glasses. Oh — and the lipstick. That's key. I always feel fancy in lipstick. love this look on you! i always feel fancy in lipstick too. it is key! I love this spring uniform - skinnies and a silky top are my go-to. Agreed on the lipstick. As soon as I swipe on some color, I feel like a real boss/lady. Is this shirt recent? I LOVE it! 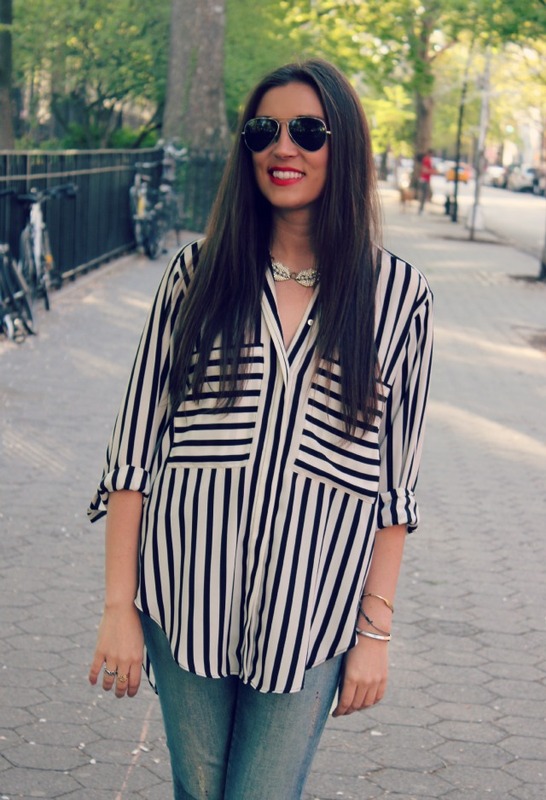 Found you via The BSoup - lovin' your style!